Colony wrapped its first season on USA Network last week, and fans were left with a lot of questions. What will happen during season two of the series? There are some teasers for the next season from Carlton Cuse, and fans may see a lot of changes next season. Cuse spoke about season two with The Hollywood Reporter, and there are plans already in place for the drama ahead. Season one ended with Will heading into Santa Monica, his son caught by the red hats, his wife alone and trying to cope with all that happened, and her daughter and nephew in the green zone. 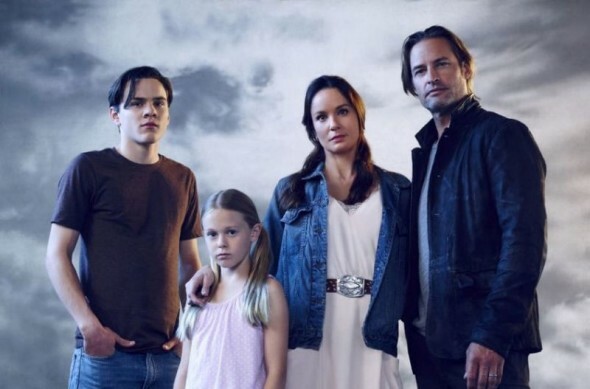 The Bowman family is divided now, but they will be together again in season two. In fact, fans might actually see the family completely reunited with Charlie rescued from Santa Monica. That means fans will learn whether or not Will finds Charlie right away when the action picks up. Finding Charlie is a huge part of Will’s life. It is where the first season began. Fans will see Will and Katie try to work on their marriage during season two as well. Can the pair fix their relationship? That is a huge part of the second season. Are you a fan of Colony? Are you excited to see season two? Tell us what you think. More about: Colony, Colony: canceled or renewed? I really loved this show and look forward to the 2nd season. I agree with Sarah, I was expecting 13 episodes and immediately thought the show was cancelled when I couldn’t find it anymore. Great show. But why stop at 10 episodes. I was so unaware and unprepared for the season to be over. Great show, I’m looking forward to season 2. I started watching because I liked Josh Holloway! Haven’t seen him since LOST. It became so much better by 3rd episode. I do not like it when I have to guess what is going on…just make it known so we can follow along. I thought it would be another “Lost” but it now has content. I hope it has a 2nd season! Colony is one of the best shows I’ve seen in a long time. I loved the action throughout Season 1. I liked how both Kate and Will did what they needed to do–all for the sake of family. I think, in season 2, they will become stronger as a family, but will still do what they need to do because the world they live in remains the same.